The original Mark 1 Seagull was a beautiful machine and is represented here by PSU1/15 Royal Tiger HAW 579. Delivered to Whittle of Highley in 1951, and painted in their stylish dark blue and red livery, it was a 39 seater. It was later sold to Buckminster of Leighton Buzzard. 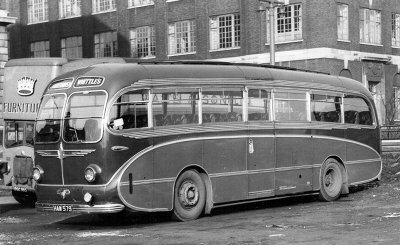 The first underfloor engined PSV chassis to be placed on the open market, the Sentinel design which evolved into the STC4 and SLC4 range, appeared at the Commercial Motor Show in October 1948 and started a revolution in single-deck bus and coach design. Despite the Sentinel�s modest sales � the type was equipped with an outmoded indirect injection engine and also suffered from poorly designed engine mountings � an early order from the prestigious Ribble Motor Services ensured that much larger manufacturers were forced to follow the Shrewsbury company�s lead by developing underfloor engined chassis of their own. 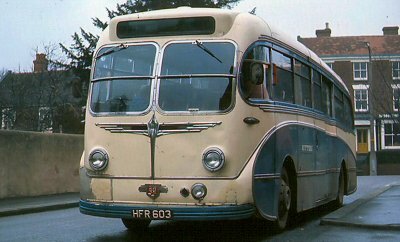 By the time of the 1950 Commercial Motor Show Leyland was offering the Royal Tiger, AEC had developed the underfloor engined Regal IV, and the list of manufacturers with similar designs soon grew to include Atkinson, Bristol (although their LS model was only available to nationalised BTC operators), Daimler, Dennis, and Guy. Within another two years the traditional front engined single-decker would have all but expired, its place on the various production lines taken by the new underfloor engined designs. Coach bodywork manufacturers were somewhat perplexed by these �bonnetless� chassis types and most of them seemed to be incapable of producing acceptably attractive models to suit the underfloor newcomers. Some of their efforts were downright ugly (the Sentinel/Beadle SLC4, visually similar designs by Roe, and the products of smaller bodybuilders such as Barnaby, Heaver, Lawson, and Thurgood). Others were merely unimaginative (the first versions of Duple�s Ambassador and Harrington�s Wayfarer being little more than adaptations of their existing front engined designs and rather �droopy� in appearance without a redeeming bonnet-line at the prow). A third group of bodywork manufacturers, in contrast, showed a surplus of imagination by producing a set of startlingly novel designs collectively referred to as the �avant-garde� school. Into this category fell the products of Bellhouse Hartwell (the bulbously nosed Landmaster), Metalcraft (which offered the choice of a European-style monstrosity with no fewer than ten windows on each side or a less offensive design exemplified by preserved Foden NTU 125), Plaxton (the �Mark 1 Venturer which was profoundly odd in its frontal styling), Whitson (which produced two designs, one resembling an American �transit bus�, the other basically a single-deck version of their ultimately avant-garde Observation Coach and latterly known as the Grand Prix), and Windover (with the Kingsway which featured a reverse-rake to its lower front panels) among others. These designs were playful and frequently amusing but were never entirely successful from an aesthetic viewpoint. Few would disagree that the most elegant of all the new offerings of 1950-51 came from H V Burlingham of Blackpool. 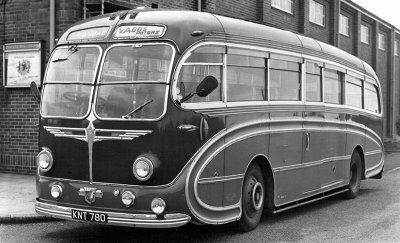 The prototype of their classic underfloor engined coach design was destined for Woods, a Blackpool operator which traded as �Seagull Coaches� and the design was soon being marketed as the Burlingham Seagull regardless of the customer involved. At the 1950 Commercial Motor Show Burlingham offered two versions of their new design. Both were of metal-framed construction and featured similar front-end assemblies with a stylised �winged sword� emblem beneath a twin windscreen, each half of which included a hinged top section for the ultimate in forced ventilation. In all other respects the two Show vehicles were fundamentally different. The vehicle for Westbury Coaches had a horizontal waist-rail and egg-shaped mouldings around each wheel arch. As far as can be ascertained no more of this type was built. The Seagull Coaches example, on the other hand, with its slightly curved waist-rail and full-length �tank moulding� (so called because its shape resembled the side view of a First World War battle-tank, encompassing both wheel arches and most of the lower panels) was an immediate hit with operators large and small, and was fated to become one of the most successful motor-coach designs in the history of the British bus industry. Something about it looked �right� in a way that had eluded all of Burlingham�s competitors, and the Blackpool firm would remain prosperous for the best part of a decade as a result. This Mark 2 was also on Royal Tiger chassis but only seated 37. An uncommon PSU1/16 variant, it was one of the last Royal Tigers produced for the domestic market and had been new to Gittins of Crickheath in 1954. When the famous Gittins brothers retired at the end of 1966 it was sold to neighbouring independent Vagg of Knockin Heath (as seen here) and painted in their unusual dark green and red colour scheme. Some years later it passed to Boulton of Cardington who still operate it as a �heritage� vehicle. With a long queue of operators knocking at their door demanding their own fleets of Seagulls, you might think that Burlingham would have been happy to leave the classic design alone for a while. Sadly this was not the case and the elegant Seagull became less so with every passing year. A cynic might suspect that Burlingham executives felt the need to come up with annual re-designs merely to justify their own salaries. The first variation, the Seagull Mark 2, emerged at the 1952 Commercial Motor Show and differed only slightly from the original in featuring a double metal strip to enclose the �tank� design on its side panels and an internally sliding central entrance door. Nevertheless it was less attractive than the Mark 1, sales were less impressive than those of the original version, and in 1953 Burlingham was forced to acknowledge this by offering the Mark 3 which reverted to the single metal strip and an externally sliding central entrance door. It was visually indistinguishable from the Mark 1 but weighed considerably less and was intended for the correspondingly lighter second-generation underfloor chassis types such as the AEC Reliance and the Leyland Tiger Cub. The Mark 3 reverted to the single metal strip around the �tank� moulding. This is PSUC1/2 Tiger Cub HFR 603, new to W C Standerwick in 1954 and shown here with its second operator, Butter of Childs Ercall. Standerwick�s parent company, Ribble, had a similar batch. The standard version of the Mark 3 retained the front dome �eyebrow blinds� of the Marks 1 and 2, but a small batch built on Tiger Cub chassis for Ribble (and their subsidiary WC Standerwick) featured a �roof box� destination display which could carry the same roller blinds as the Ribble group�s large fleet of Leyland-bodied Royal Tiger coaches. Leyland had decided to close its in-house bodybuilding works and Burlingham was more than willing to adapt its design to capture Ribble�s order. Wonderful. A fascinating insight into a design I had always (wrongly) taken for granted. Yes - a beautiful design deserving a "classic" status. Looking forward to the next installment. I have indicated before - on this site - my predeliction for Burlinghams. I'm delighted that an expert series of articles will deepen my knowledge. Thank you! I was much intrigued by your article and well remember the Whittles coach in the first photograph above when I was a bus driver employed by the "Midland Red". As a driver operating from BMMO Kidderminster Garage from 1958-1967 commencing at the age of 21 years, just old enough to hold an "all groups" PSV drivers licence � DD39159. At this time, Kidderminster was very much a carpet-producing town in an era of easy employment and jobs were ten-a-penny. Carpet workers all over town awaited the blare of Brinton Carpets �horn� before surging onto the streets at the end of their working day. In Market Street next the General Post Office would stand Whittle�s Royal Tiger coach ready to ferry workers home to Highley and Alveley. In this period, Royal Air Force Bridgnorth operated as a "boot camp" or "square bashing unit" - catering for raw recruits, and I, myself was there in 1955. Later, in 1958 I was to park a "Midland Red" bus on the parade ground. This was on a Saturday around mid-day and my conductor and I were to transport RAF personnel on a weekend pass to Birmingham and Wolverhampton rail heads. Whittle�s Royal Tiger was to take RAF personnel to Scotland; returning to Bridgnorth by Sunday no later than 23:59hrs!